Mandatory Reading for Freshmen Legislators - Mark Miewurd's HelloFLA! Because of term limits, most legislators today know John Phellps as the Staff Director of the Senate Rules Committee. They may not know this statesman among us was the Clerk of the Florida House from 1986 to 2006! Before him, was a clerk named Dr. Allen Morris. He literally wrote the book on Florida Government. That’s exactly why they compiled the most interesting book you will ever get from the Clerks Office called Reconsiderations. The future Speaker Haber (pictured) was set-up by Chairman Gersten for this unfriendly photo-op that drew unwanted attention to a multi-million dollar appropriation he secured for his district. When Haber became Speaker that November, the porking prankster Gersten was chairman of nothing and his prestigious committees were only a memory! This is the original insider gossip! The cartoons were drawn by Representative Betty Easley. 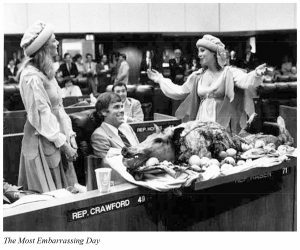 Photographers Donn Dughi and Mark Foley contributed the pictures from years past of events that legislators recalled. Miami Herald Reporter John B McDermott even contributed with memories from the Senate. Or how even Miami didn’t want to be bothered by Tallahassee back then. On page 83 of the PDF (printed 75) is a story about how Miami’s Senator R. B. “Bunn” Gautier beat the Pork chop Gang in 1955 to get home rule for Dade County.